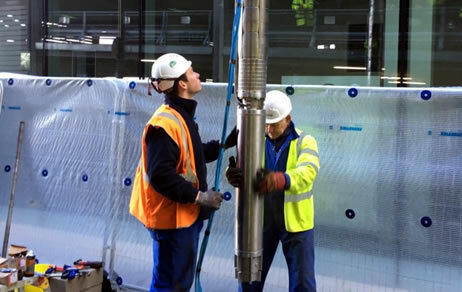 A recent project saw us revisit a borehole water supply used for a cooling and heating system used for an office block in a city centre location. The submersible borehole pumps had been installed a long time, in excess of 10 years, having originally been installed by us. Although still operational the client wanted them removed and serviced such that they continued for the next 10 years! Our client worked closely with our directors Nick Dodds and Joe Barnett to formulate a plan of how to exchange the installed pump for a new pump over a quieter weekend period when the offices were closed, the street could be closed off to the general public, and any shops could be asked to remain shut for the duration of the works. Dales Water confirmed that the works could be undertaken during the weekend and that the system would be back online by Monday morning. The submersible pumps exchange therefore occurred over a weekend period utilising a contract crane lift and many of Dales Waters bespoke lifting equipment components to ensure that the pump exchange ran smoothly to meet the time constraints. The work was undertaken, the pump exchanged successfully in the available time frame and the office complex provided with an energy efficient heating and cooling system… ready for the next 10 years.